Many of us know the story of how Meir Zlotowitz, a young graphic artist, started a company -- and a Torah revolution -- called ArtScroll. In this scrupulously researched and beautifully written biography, author Yisroel Besser paints a stunning portrait of a remarkable man, one of the greatest Torah disseminators of our time; a giant with global impact who managed, at the same time, to be devoted to his family and loyal to his friends. Busy building a Torah empire, he somehow always managed to find the time to advise and help the countless friends and strangers who sought him out. What was the secret of Rabbi Zlotowitz's phenomenal success? How did he establish relationships with the greatest Torah luminaries of the time? How did his personal challenges affect the person he became? What role did his rebbi, Rav Moshe Feinstein, play? How did he attract supporters from the entire spectrum of Jewish life even while being unapologetically rooted in the world of the yeshiva? What sort of advice and guidance did he offer younger businessmen, educators and activists who looked to "Uncle Meir' as a mentor? Most important of all: How did he maintain his care and concern for every individual, while devoting himself so wholeheartedly to the entire Jewish people? This book is a page-turner, a hard-to-put-down masterpiece that will inspire you to reach out and change the world -- while investing yourself in those closest to you, your family and friends. 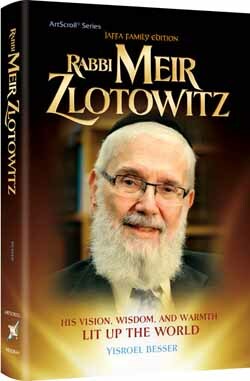 It's a story not only about what Rabbi Meir Zlotowitz did, but about what he was. A story of one man’s courage, his vision, and his unwavering faith in the Jewish People and their Torah. We hope you will continue to search through our shop and find something you would like to order.